The Sussex Spaniel is one of the earliest developed spaniel breeds (recognised as such since 1790) but unfortunately is one of the rarest. At the end of World War II there were only eight of the breed in England and all the present-day Sussex have descended from them. The Sussex was bred to work in heavy cover such as bramble and rhododendron on the estates of Rosehill, Sussex. The Sussex will carry sticks and assorted things of their own accord but need early, patient training to retrieve successfully. The Sussex can live up to 11 years of age. The Sussex Spaniel is generally a placid, person oriented gundog; typical of most gundog breeds. They do have unique qualities, and are known for their grinning and at times clownish behaviour. For a dog of their height and weight the Sussex can be surprisingly agile, and they can be readily house-trained and are suitable as indoor or outdoor dogs. Being gentle by nature, it responds well to kind training and should not be bullied or treated too firmly - nonetheless basic training is a must. The Sussex also has a reputation for being a fussy eater. They should be familiarised with other household pets as early as possible, they usually live happily with other like-minded creatures. They are more likely to give the magpies or sparrows a chase than another pet they have grown up with. They should be brushed regularly (2 to 3 times a week). For showing and general well being the Sussex requires only minimal trimming. The feet should be checked for grass-seeds and the ears checked regularly and kept clean. As they are heavily boned dogs they should be fed a suitable puppy food providing calcium supplements when growing. Frequent climbing up and down of stairs should be avoided whilst in the early growing stages. They can be quite active and should be given long walks or plenty of free running as they mature. Once the surplus energy is expended they can become couch potatoes, but don't let them become obese. Good basic training is essential, being hunting dogs they can suffer from ‘selective deafness’ when scenting or free running. When buying a puppy make sure the parents have been hip scored and eye tested. 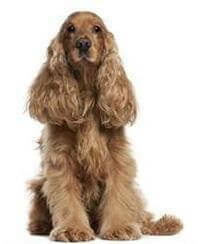 The Sussex has a unique gold-tipped lined coat; when young the pups are quite dark and the correct colour develops with age. As they are slow to mature it takes quite a while for their full potential to be reached in the show ring. Although bred as a hunting dog the Sussex Spaniel makes an excellent family/companion animal. They are great with children if familiarised early and properly. They enjoy human company and so do not enjoy being left without attention for long periods.